developed quite a portfolio of catering services. with others the choice is a matter of personal preference. specific there are advantages and disadvantages with each. as weather conditions and also because some options are specifically tailored to suit particular types of events. Throughout this article each of the catering options provided by Executive Coach and Catering Services will be thoroughly analysed, highlighting the advantages and disadvantages of each. Hopefully each analysis will provide enough information for prospective customers and help eliminate unsuitable options for their wedding day. 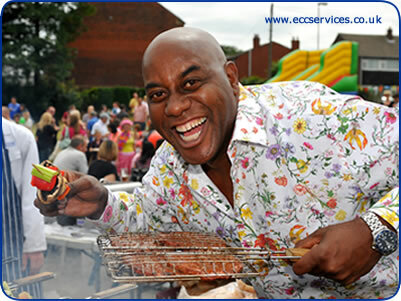 Barbecues are a very efficient catering option and are becoming increasingly popular for weddings. Some opt for a barbecue to replace the afternoon meal whereas others choose it to replace the evening buffet, both work well. Our custom made barbecues are very large and therefore very efficient; they allow a lot of food to be cooked at once. This makes a wedding barbecue ideal when a lot of guests are being catered for. The barbecues, which measure about seven foot, can cook a range of food at the same time, this helps with speed of service and again as mentioned previously, efficiency. Although the idea of a wedding barbecue on a nice summer’s day sounds perfect, the reality is that the British weather is unpredictable. For a wedding barbecue there can be no certainties and unfortunately heavy rain and cold weather can affect both the cooking of the food and the spirits of your guests. Despite providing our own gazebos to serve from it is dangerous for our chefs to cook on the barbecue under anything other than fresh air. Unfortunately this means that during heavy downpours the cooking of the food on the barbecue can be quite a slow and tedious process. Again however this is the chance you take with a wedding barbecue. Similar to a wedding barbecue, a wedding hog roast is a great way to feed a large number of people in a short space of time. 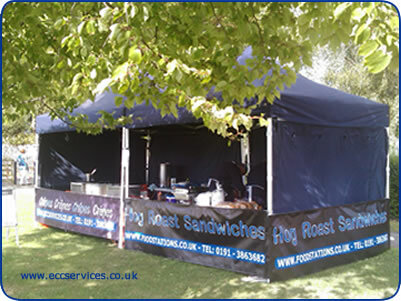 The hog roast catering option is our most popular and therefore the staff are extremely efficient and well capable of serving an excessive number of people in one sitting. A single hog roast can serve between 50 and 200 people, compare this to the number of meat joints you would have to buy to cater for the same amount of people and you can see how resourceful a hog roast is. Although it is very cost effective considering the number of guests it can feed, a wedding hog roast lacks one thing, variety. 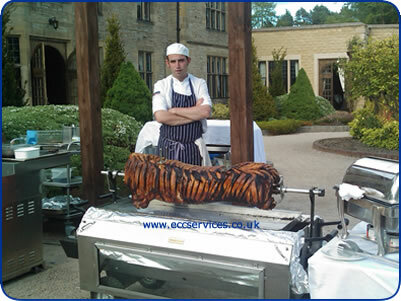 There are a range of extras you can add to a wedding hog roast such as salad and vegetables but unless you combine a wedding hog roast with another catering option guests are going to be left with very little choice. Without a doubt a wedding hog roast is a great option to consider and a cost effective option to choose for larger weddings this works well for day and night menu options. Executive Coach and Catering Services offer a wide range of food station options and each of these can be specifically designed to suit any wedding day. Typical food stations include crepe stations and jacket potato stations; these are two of the most popular choices. The idea of creating a food station allows the bride and groom to tailor their wedding catering specifically to the needs of themselves and their guests. However for some a single or double food station may not be enough variety to suit their needs. Although the stations do offer a large selection of food, it would be difficult to cater for everyone’s needs and provide a sustainable meal using the food station service. A savoury food station and a sweet food station is a very good idea but are they going to provide an option for all your guests? What we have found to work well in the past is combining the food stations together to create more choice or choose a food station for the night time food only and consider some of the other menu options for the day. 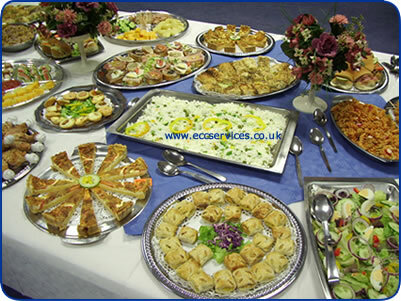 There are two main advantages of choosing a cold wedding buffet, these are simplicity and variety. 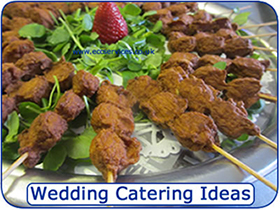 Cold wedding buffets are usually employed as a catering option for the evening reception of a wedding as opposed to a replacement for the traditional afternoon meal. We offer a vast range of cold wedding buffet options; these can be mixed and matched to add even more variety. Although the other choices in this list may be better suited in terms of serving large numbers of people, it is variety which draws people towards choosing a cold wedding buffet. However as stated this option is inferior in terms of service time and service numbers. Ordering a cold wedding buffet to cater for a large number of guests would be a lot more complicated in comparison to the hog roast for example. Although the variety would be welcomed by most guests the efficiency of the hog roast would be lost. From experience there is usually a lot of waste food at a buffet. Although a lot of customers draw on the experience of our staff some find it difficult to predict which buffet items will be most popular and how many people to cater for. Maybe more variety isn’t best after all. Also, a cold wedding buffet can take up a lot of room at your wedding venue, depending on how many guests are being catered for and the size of the room or rooms being used. The buffet needs to be laid out on tables at the venue somehow; this could limit the space available for other necessities such as a DJ or a dance floor. Hot wedding buffets don’t seem to be as popular as cold wedding buffets. These can be quite messy affairs with dishes such as Mexican chilli and lasagne included in the menus. With guests all dressed in their best suits and dresses hot buffet dishes are not the most suitable, especially if there are children in attendance. However hot wedding buffets are great in terms of hot food variety. Our full menu includes seven dishes complete with side dishes and additional side dishes if required. Compared to the hog roast this menu gives guests much more choice in regard to hot food. As well as being a great substitute for the traditional evening reception buffet these dishes are also an ideal alternative to the traditional meal often enjoyed on the afternoon after the wedding ceremony. They can be sealed and served in individual containers limiting any mess and ensuring all guests are served quickly. To view our hot buffet menu please take a look at our hot buffet page for more ideas. 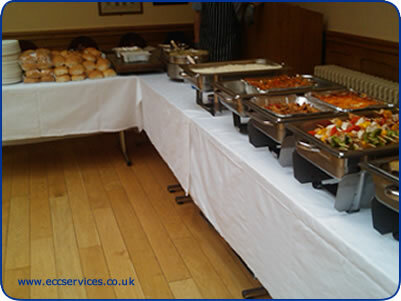 Looking at the whole range of buffets available the option of a combination buffet is probably the most effective if you are looking for a wide range of different foods and looking to feed a large number of guests. 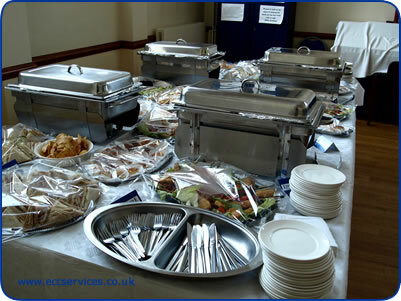 The main advantage of choosing a combination of buffets is the choice it offers. Mixing and matching cold and hot buffet options allows you to combine certain dishes from certain menus to create your ultimate wedding buffet. This could include food suitable for vegetarians and children. We have have nearly 30 years of experience in their field and when building their own individual buffet packages they know how many people it will serve. If menus are mixed and matched and extra dishes ordered for this and that then the likelihood is that too much or too little food will be ordered. As a result of ordering too much food the cost could become excessive. Contact us to speak with a member of staff to discuss your requirements and take a look around our site you can mix and match any of our menus to create the ideal wedding food package. 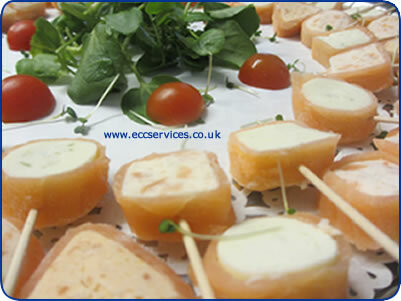 Wedding canapés are very traditional and although not everyone’s first choice they are very popular at weddings. The need for canapés very much depends on the type of wedding and the agenda for the day, for some there will be no need. The main advantage of providing canapés is the price, they are very cheap. Our canapés are £1 each + VAT. They are all handmade and add a very nice touch of glamour to any wedding day. This said however canapés are very small and are really only used as an appetizer rather than a meal replacement. If you are looking at having canapés and a champagne reception then you must look at this in relation to the whole day. Another thing to consider when adding canapes to the food menu is the time of day and how many per person? You need to think about how long guests have been with out food, if it's over 3 hours guests will be hungry and this will increase the amount of canapes you should provide. On average we would suggest 3 to 5 per guest, take a look at our canapes page to see the choices.